As it spread from country to country, it acquired a wide variety of cultural trappings; special clothes and hats, status, incense, gongs, bells, whistles - even peculiar architectural forms, icons and symbols ... In fact, all too often, such things get in the way. Steve Hagen was writing about Buddhism, plain and simple. But he may just as well have been writing about classical music. Last night in the packed Theatre Royal, Norwich there were no bells or whistles. Just a Steinway slightly right of centre stage and a microphone in front of it for the seamlessly integrated links. Plus Philip Glass, dressed creative casual, delivering a ninety minute set unbroken by intermission or any other cultural trapping. Nothing to get in the way of one of an evening that rose effortlessly above culturally defined music making. 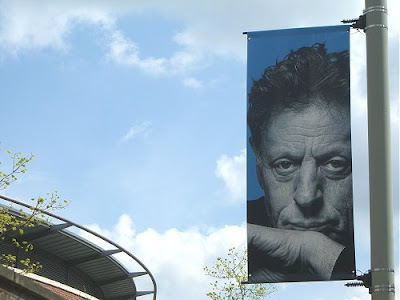 Philip Glass is more than a pianist, more than a composer. He is that most precious of beings, a free mind. The visual underlined just how free that mind is, particularly in the ever inventive Études. We could see these being driven by the motor of the left hand, while the right embellished in the treble and crossed sparingly to release those dark chords which underpin the music. 'Moving' is a word that has lost its true meaning. It has nothing to do with tears and pathos. It means transported to another plane. Last night Philip Glass showed how music, pure and simple, can still release us from an increasingly tawdry world and transport us to another plane. A remarkable and moving evening. Philip Glass' programme last night included Mad Rush. This was written for the Dalai Lama's first public address in New York City, in autumn 1981. Originally an open-structured or open-ended piece, it was first performed by Glass on organ during the Dalai Lama's entrance into the Cathedral of St. John the Divine. It is one of many of Philip Glass' works for solo piano on the very affordable Essential minimal piano collection. Nice post. I enjoyed last night's concert and was quite taken by the simplicity of it: Glass's line about concentrating on the music was a good summary. I think it may have been one of the most well attended events in the Festival. Worth noting, by the way, that the free outdoor performance that opened the festival (by Le Snob) involved a few living composers of note (Glass, Nyman too, perhaps others?) - greeted with similar enthusiasm by devotees and passers-by.